If you were worried that you wouldn’t make it through this racing offseason, never fear! There’s some live coverage back on this weekend! 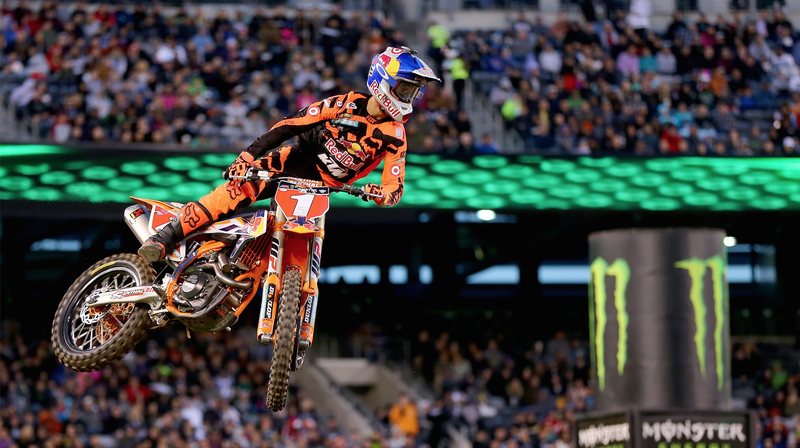 The live coverage is mainly from Monster Energy Supercross, which will run its season opener in Anaheim, California on Saturday night. If you don’t usually follow the series or need some updates heading into the new season, you can find a season-preview show listed on the schedule below as well. Other than that, the Dakar Rally is running live this weekend—the only problem is that you can’t necessarily watch it live. The Dakar Rally runs through Bolivia and Argentina, and is one of the most grueling races around. The first stage began in Buenos Aires, Argentina on Jan. 3, and the rally will wrap up in Rosario, Argentina on Jan. 16. A reigning champion of the race, Toby Price, is already out with a broken leg and lightning struck another rider during the third stage of the rally. There isn’t live video coverage of the rally, but there are multiple ways to follow the race. The Dakar Rally YouTube channel has wrap-up videos from the days’ events, and a daily recap show or two are listed in the schedule below. You can also follow live timing on the Dakar website, and we rounded up every possible way you can follow the rally in this post. Other than that, there’s plenty of coverage on tape delay. Hang in there! There are only a few more weeks before there will be so much racing on that your DVR won’t be able to take it. If you know of any additional events or streams going on this weekend, please feel free to share in the comments below.